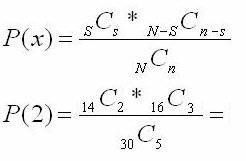 The Hypergeometric Distribution is like the binomial distribution since there are TWO outcomes. The difference is the trials are done WITHOUT replacement. For example when flipping a coin each outcome (head or tail) has the same probability each time. Both heads and tails are outcomes every time on each trial. Therefore the binomial distribution formulas apply in that case. Population, N, is finite and a known value. Two outcomes - call them SUCCESS (S) and FAILURE (F). 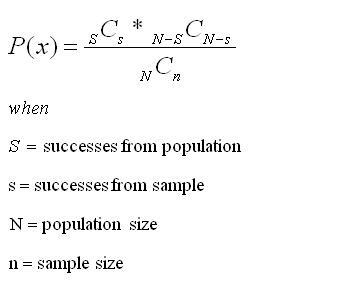 Number of successes in the population is known, S.
Used when sample size, n, is greater than or equal to 5% of N.
Trials are done without replacement, dependent. A sample of 5 parts are drawn without replacement from a total population of 30 parts. Determine the probability of getting exactly 2 defective parts. The population is known to have 14 defective parts. There are two outcomes and n/N = 5/30 = 16.6% which satisfies assumptions. The denominator represents the total amount of combinations of selecting 5 parts from 30 parts, which is 142,506 for this example. Keep in mind, this says "defective" parts. Each part may have one or more "defects" that cause the part to be appraised as a "defective" part. There is a difference between and defective part and a defect on a part. Reminder, most statistical software can solve for probabilities when given the inputs.